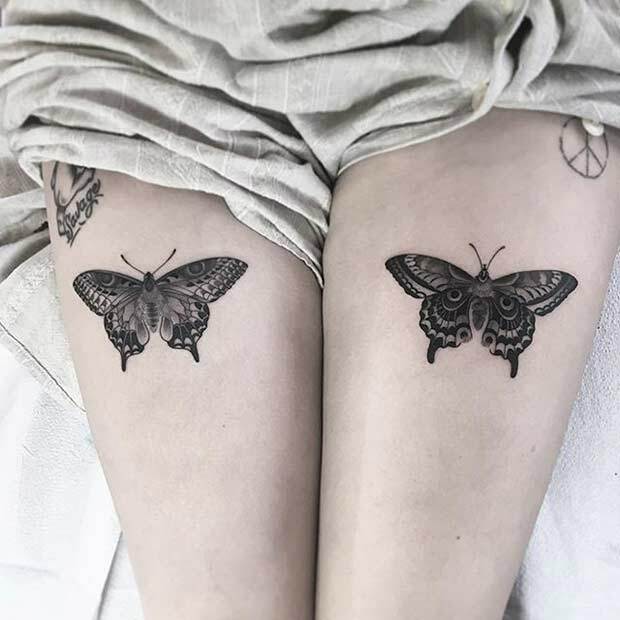 Thigh tattoos – we love them because you can hide them or show them off, depending on your mood that day. 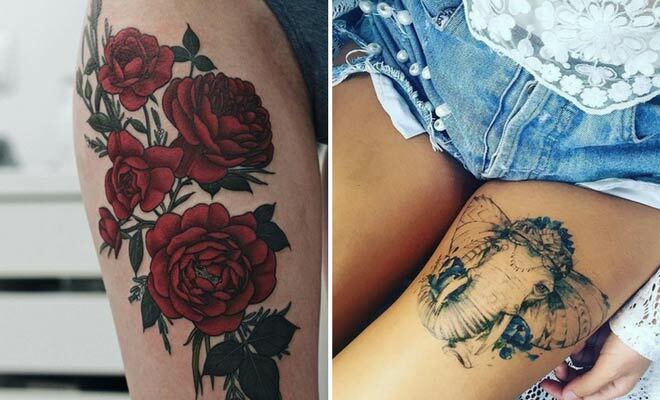 If you’re in the market for badass thigh tattoo ideas for women, you’ve definitely come to the right place. We’ve found 45 designs that we think will blow your socks off … Although we’ll warn you, it might sting a little! Are you sitting comfortably? Shall we begin? 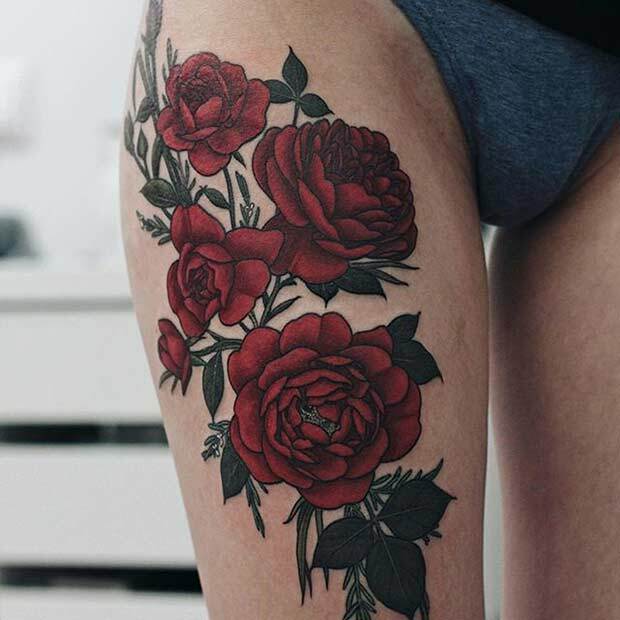 This red roses piece is a beautiful idea for a badass thigh tattoo for women, but you should know of the prep work you’ll need to put in. For example, did you know that’s you can’t drink before a tattoo? Drinking heavily the night before isn’t advisable either. Not only can this make your bleed more throughout the tattoo, but it’ll also hurt more. Your sensitivity will be heightened, and because you will also be dehydrated and hungover, you’ll probably find that you feel ill / like passing out. The moral to this story – drinking before a tattoo is a bad idea. 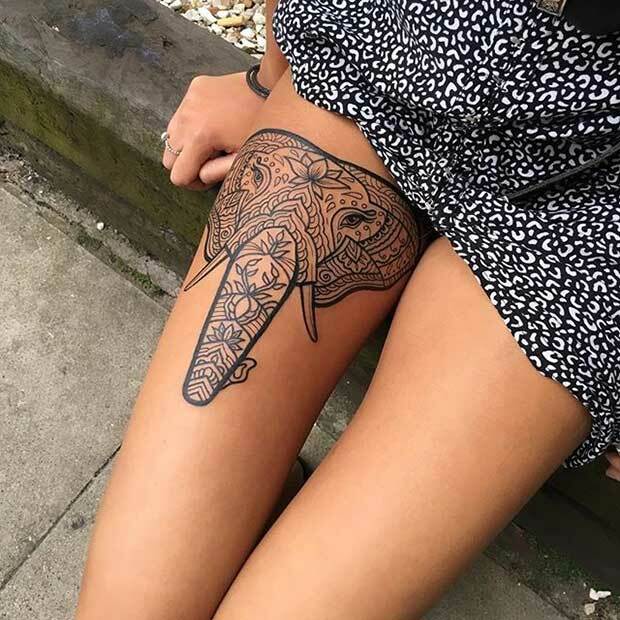 Elephant tattoos can signify a number of different things. The elephant is a strong animal, determined, dignified and wise. This mandala elephant could mean that, or it could mean prosperity and good fortune. Those are two more significant meanings to the elephant ink. Isn’t it amazing how something can mean one thing to one person, and something else entirely to someone else? That’s the beauty of tattoo work. Lotus flower tattoos have very spiritual undertones surrounding them. 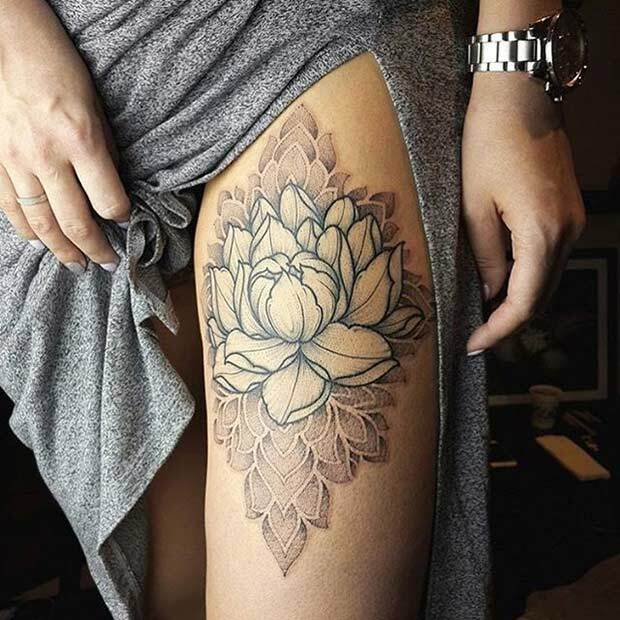 Badass thigh tattoo ideas for women like these are great for showing off some of your inner spiritual side, without making it too obvious at the same time. Very few people would actually see your thighs, meaning he tattoo would be a very private one for you. That’s if you wanted it to be private, of course. We LOVE to show ours off! 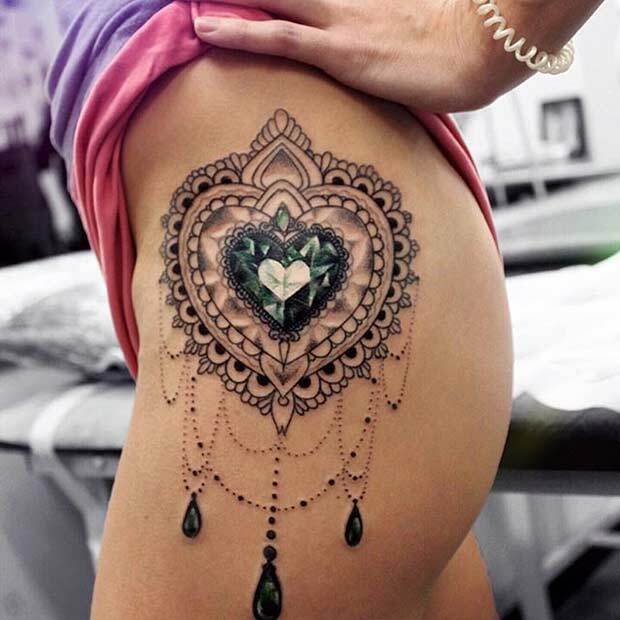 This diamond inspired thigh piece is a beautiful tattoo, but you should know that a hearty breakfast is vital before you head off for ink work like this. You definitely won’t want to sit for this kind of piece on an empty stomach. There’s a good chance you won’t be able to handle it. We love the bee design on this unique floral little number, and the bee tattoo is said to signify a really hard worked. And isn’t that just what bees are? 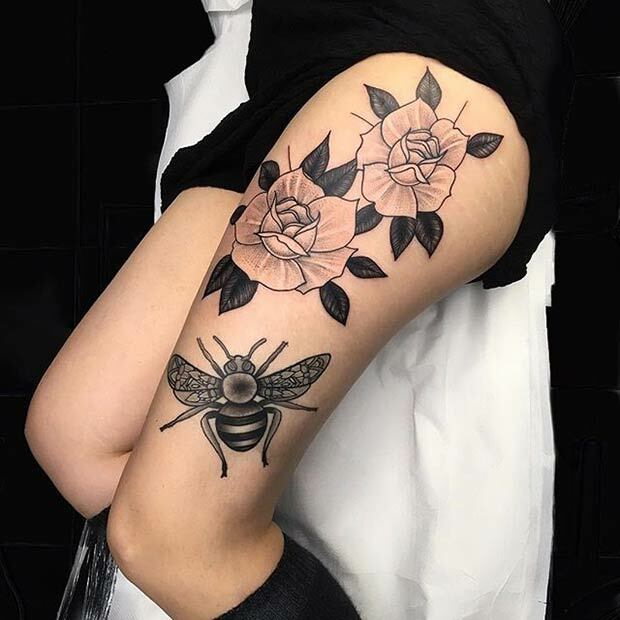 Hard working little insects pollinating all those flowers and scaring the heebie-jeebies out of those of us who are scared of them … Often used in tattooed to symbolise family, teamwork and nobility, the humble bee tattoo works perfectly in this floral thigh design. 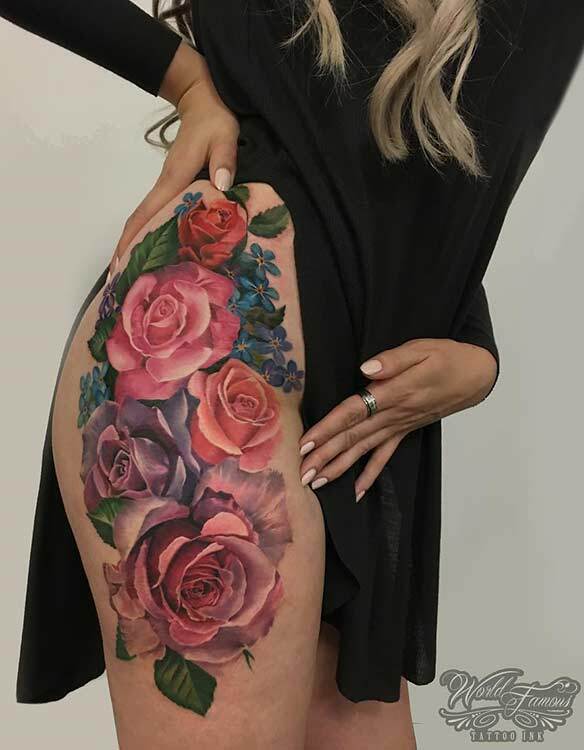 While we’re on the subject of floral tattoos, rose tattoos are one of the most common and popular tattoos you’ll see these days, and there are many reasons for that. Once upon a time, these were tattoos considered suitable for women, but more and more men are choosing to have them as well. With origins in American culture, the rose is a classic symbol of love, much as the flower itself is. 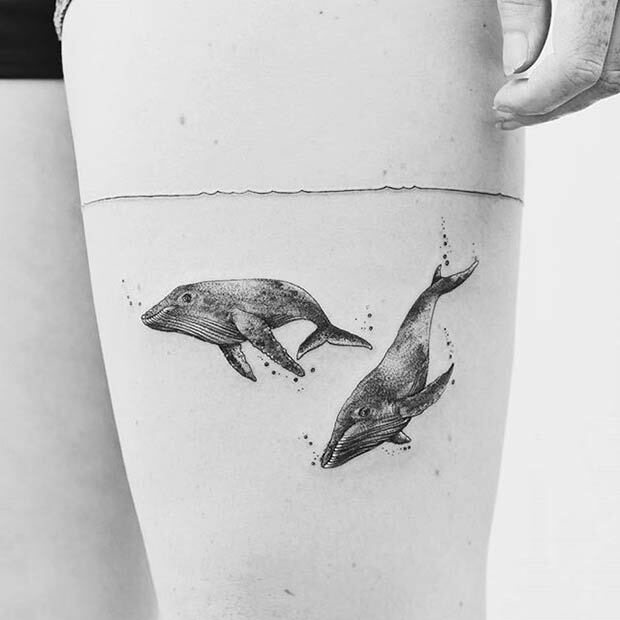 We know one thing – we love this badass thigh tattoo for women. 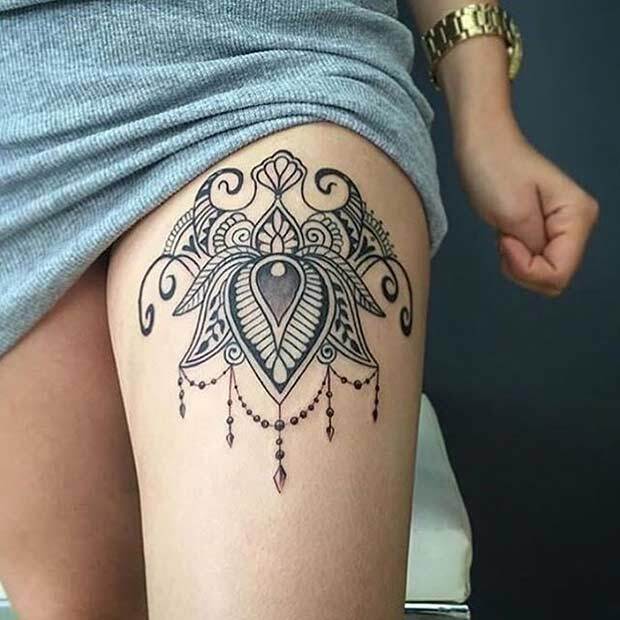 Tattoo care is very important and that’s the case whether you’re going for a colourful design, or a black and white one just like this beautiful design. Your tattoo artist will give you instructions on how to care for it to ensure it lasts beautiful for as long as possible, and you should listen to and follow all advice given. Your tattooist will know what they are doing if you have opted for a reputable, reliable and fully-trained one. Moth tattoos are not just beautiful tattoos, they are tattoos with meaning too. They are used to symbolise a number of different things, but they are mostly attributed to secret knowledge and dreams. They are nocturnal by nature, and this is what gives them the link. You should be aware they are also used to show other character attributes however, determination and faith being just two of them. Have you ever seen a moth trying to fly into the light? That’s sheer determination – the flying flutter just doesn’t want to give up! Whales are truly magnificent animals, both in size and stature. They’ve been around for a very long time, and they manage to stay silent and almost unseen in the depths of the ocean. Some of these depths we won’t ever get to see or hear about in our lifetimes. The gentle giants are becoming more and more popular in the tattoo world, often linked with spirituality. They can also show peace, love and understanding, as well as motherhood, guidance and protection, ands also harmony and intuition. You will need to both leave the tattoo alone, and take care of it, all at the same time. This doesn’t make a lot of sense, but it does when you break it down. You should be washing it carefully with an antibacterial soap that is unscented. This is to keep away any infections and bugs that may get in. An infected tattoo is not a nice one. Just Google the photos and you’ll see what we mean.